WHAT IS THE SCALE AND SHAPE OF GLOBAL POVERTY ? 1. The elimination of poverty is one of the United Nation’s four main 'Purposes' written into its Charter adopted at its formation in 1945. It is also embedded in the U.N. Declaration of Human Rights, adopted in 1948. This prime need to eliminate poverty has been restated and emphasised on numerous occasions (by the U.N. and many other bodies) in every decade since. •	An estimated 4.3 billion people (56% of the world's population) are living with less than $5 a day and are unable to meet basic needs adequately. •	800 million people go to bed hungry every day. •	UNICEF estimates that around half of the world’s children live in poverty. •	According to UNICEF almost 3 billion people lack access to toilets and almost 1 billion lack access to clean drinking water. •	4.5 billion people do not have safely managed sanitation, with waste disposed of in a way that will not contaminate drinking water. •	The World Bank said in 2015 that 702.1 million people were living in ‘extreme poverty’ (then defined by the World Bank as having less than $1.90 per day on which to live). •	One third of all deaths in the world - some 18 million people a year or 50,000 per day - are due to poverty-related causes. That's 270 million people since 1990, the majority of these were women and children. •	Every year nearly 11 million children die before their fifth birthday. Of these, 19,000 die each day from preventable causes. •	There are upwards of 100 million ‘street children’ worldwide. •	Each year contaminated water kills half a million children under five through diarrhoeal diseases, the WHO says. •	Widely forecast predictions about Climate Change are that it will impoverish the whole of humanity. It will greatly reduce the world’s human population (it is already decimating other species). It will certainly affect the poorest the most, and the most quickly. In January 2018, Oxfam reported that 82% of all the wealth generated during 2017 went to the richest 1% of the global population, while the 3.7 billion people who made up the poorest half of the world saw no increase in their wealth. Oxfam reported that : “Dangerous, poorly paid work for the many is supporting extreme wealth for the few. Women are in the worst work, and almost all the super-rich are men. Governments must create a more equal society by prioritizing ordinary workers and small-scale food producers instead of the rich and powerful…The slight decrease in development aid spending in 2017 is bad news for the fight to end poverty and reduce inequalities” said Oxfam in response to the publication of new aid figures by the Organisation for Economic Cooperation and Development (OECD). •	7 countries are home to 58% of the world’s hungry: India, China, Pakistan, Ethiopia, Bangladesh, Indonesia, and Tanzania. •	The poorest 20% of the world’s children are twice as likely as the richest 20% to be stunted by poor nutrition and to die before their 5th birthday. •	Each year 2.7 million newborns worldwide die within their first month of life. •	Almost 200 million children under the age of 5 in developing regions are underweight for their age. •	179 million infants in the least developed countries are not protected from diseases by routine immunization. •	3.2 million children under the age of 15 currently live with HIV. •	161 million children do not attend primary school. The number of people suffering from hunger is greater than the total combined population of the U.S.A, Canada and the European Union. 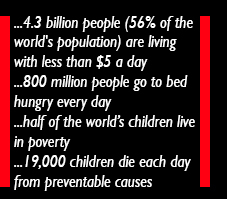 In 1990 a common definition of extreme poverty was ‘less than $1 per day’. By 2008 the World Bank adopted a definition of less than $1.25 per day. In 2015 they reset it to $1.90 per day. These figures are obviously ‘picked out of the air’ because they are very hard to justify as indications of anything like ‘acceptable’ living standards across many different cultures and economies. poverty often use different concepts such as ‘extreme poverty’, ‘absolute poverty’, ‘abject poverty’, ‘ultra poverty’, ‘relative poverty’, etc, with different definitions of where the boundaries may lie. So, poverty can be and is measured in different ways by governments, international organisations, NGOs and charities, policy makers and academics. Whatever the figures, poverty is multi-dimensional including many economic, social, political and other factors affecting people’s lives and prospects. Poverty includes the critical element of 'Marginalisation', the various ways by which the poor are kept distant from any political power which might enable them to change the policies which keep them in poverty. COULD THIS BE DIFFERENT - COULD POVERTY BE ENDED ? 8. According to the United Nation’s Food and Agriculture Organisation world hunger can be eliminated by 2030 with an additional $265 billion per year in resources. How does that compare to other current political priorities in - for example - the world’s richest country ? •	The 2016 U.S. annual Defense Budget was $612 billion. •	Lockheed Martin F-35 Joint Strike Fighter Program costs $324.1 billion. •	Cost of each new USA Aircraft Carrier is $13 Billion (for the purpose of inflicting death and destruction around the world). •	The financial cost just to the USA of the wars in Afghanistan and Iraq (not counting all the financial costs to its ‘allies’) is conservatively estimated at $6 trillion (£3.6 trillion) to date, and the costs are still rising (Source : the Cost of War Project at the Watson Institute of International and Public Affairs in Boston, USA). •	Of course, the human costs of the U.SA.’s wars in Afghanistan and Iraq are dreadful : At least one million dead, millions injured and their lives transformed, and around 8 million displaced. 9. There are costs attached to many other wars and conflicts conducted by the USA around the world. There are also many other countries conducting wars and conflicts and those all have costs too. 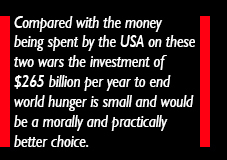 Compared with the money being spent by the USA on these two wars the investment of $265 billion per year to end world hunger is small and would be a morally and practically better choice. 10. Poverty is always political - it is caused by the political choices made by powerful elites : Governments, wealthy corporations and others. The United Nations (and many other bodies) over the past several decades have frequently reminded us that Poverty is always a human rights violation. 11. Poverty and inequality are among a number of problems which are known as examples of ‘structural violence’ – all created by the decisions of those with power which degrade or destroy the lives of those with little or no power. The root causes of poverty are systemic and these marginalise and disempower people who cannot (even when they are well-organised) change the system to effectively remove poverty. due to the policies of your government then your government needs to change its policies to remove your poverty. If you are poor due to the policies of another government then those policies need to be changed. Many people are poor due to the policies or actions of business or corporations which are enabled by laws and regulations to favour their own profits over people and planet. Poverty is political. 13. By some measures global poverty as a whole has been reducing gradually but it remains an enormous problem, and is growing in some places. Between 1990 and the present day it is widely estimated that around three quarters of global poverty reduction was achieved in China (a communist country) not in neoliberal capitalist countries. Indeed, the evidence is that neoliberal capitalism impoverishes the poor and enriches the rich. Poverty is political. Special Rapporteur on Extreme Poverty investigated poverty in the U.S.A. and then in the U.K. These are two of the world’s wealthiest countries and are the world’s two main proponents of neoliberal ‘disaster capitalism’. He also presented a range of key facts showing the wide extent of poverty in each country and this was covered in the media in each country. This was roundly condemned by both country’s governments who exhibited all the signs of being in extreme denial about poverty caused by themselves. This shows that it is extremely hard to get some politicians and governments to admit and (even more) to take responsibility for the poverty caused by their own policies. And those are two of the world’s richest countries. Poverty is political. 15. Numerous bodies, including Oxfam, have shown that the money secreted away by wealthy individuals and corporations in Tax Havens is so great (approaching $20 Trillion) that if it were taxed annually (at very modest rates) the money raised could end extreme poverty worldwide twice over. But governments and international bodies are very slow (many are simply unwilling) to start taxing this vast wealth, which is more than 10% of global GDP. 16. For comparison, the cost of ending extreme poverty in the whole world (by giving people a minimum income of $1.90 per day) would be $100 billion. That is just a small fraction of the Tax being avoided by companies and corporations across the world. And that does not count all the other Tax dodging on an industrial scale by wealthy individuals and on various property and other asset transfers. 17. So, much more can be done if governments would Tax income and wealth properly. However, the political and economic elites have shown they are reluctant to do this or to end the vast Tax dodging industry. This disgraceful failure is condemning billions of people to grinding poverty, poor health, low life chances and low life expectancy. Poverty is political. 18. In Africa, the poorest continent on the planet, the Taxes dodged by companies and corporations are robbing African countries of at least $160 billion every year. This is much more than the annual cost of lifting the whole world out of extreme poverty. So, this ‘missing’ income from tax could remove all extreme poverty across Africa and do much more to permanently develop Africa and lift it out of poverty. Poverty in Africa persists because governments and international bodies are not changing policies to stop it. Poverty is political. 19. Neoliberal globalisation has rendered the global tax system ineffective. More and more companies are organised to trade within complex, interrelated corporate structures. Profit-shifting (moving profits to bank accounts, often secret, in low-tax or no-tax jurisdictions, or ‘Tax Havens’) by multinational corporations reduces the tax on themselves while increasing the burden on other taxpayers. It avoids the corporations’ civic and social obligations and it robs developed and developing countries of vital resources needed to fund public services and fight poverty. It exacerbates income inequality, and increases developing countries’ reliance on foreign aid or assistance. 20. The low tax policies of any one country (for example Luxembourg or the Cayman Islands) severely reduces other countries’ ability to raise taxes that could be spent on education, healthcare, agricultural development and food distribution, safe roads, and many other things, all of which contribute to poverty relief. In this way, countries run on the basis of neoliberal capitalism allow huge multinational corporations to dodge their tax obligations and keep billions of poor people in poverty across the world. means that anyone suggesting that businesses or corporations can be relied upon to reduce poverty is seriously misled – and trying to mislead the rest of us. This neoliberal orthodoxy is now followed by many governments who also cannot be relied on to reduce poverty. They are busy ensuring that the rich are getting richer. 22. 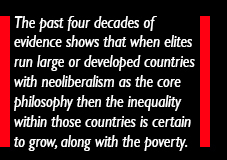 The past four decades of evidence shows that when elites run large or developed countries with neoliberalism as the core philosophy then the inequality within those countries is certain to grow, along with the poverty. In the two main global proponents of neoliberal ‘disaster capitalism’ over the past four decades (the U.S.A. and the U.K.) this is exactly what has happened. In these and similar countries it is now common even for many people in full-time work to still be living in poverty. Precarious and insecure forms of employment and low pay (sometimes called ‘the precariat’ and ‘the gig economy’, particularly in the private sector) ensure poverty even in the wealthiest countries. Many academics and others (with plenty of supporting evidence) observe that the neoliberal policies promoted by global financial institutions such as the IMF and the World Bank exacerbate both inequality and poverty around the world, making the poor even poorer. 23. Since the late 1970s businesses and corporations have been encouraged and enabled to ‘globalise’ their financial flows and movements allowing them to move capital, profits and jobs to wherever they wish. This is the core of neoliberal capitalism, or ‘disaster capitalism’ by another name. any real power or control over our own lives and fates. The Global Concerns we feature on this website reflect this reality – the great mass of the world’s citizens are at the mercy of tiny elites who wield all the economic and political power – and they intend to keep it that way. 25. The great mass of world citizens have little or no chance of making more than slight or cosmetic changes to key policies. This is as true in the rich developed countries as it is in the poor countries of the world (see paragraphs 16-17 here for an insight into how marginalization works within the U.S.A.). Paul Krugman, one of the most influential economists in the world, and winner of the 2008 Nobel Memorial Prize in Economic Sciences has stated : “Bad ideas flourish because they are in the interests of powerful people.” Another way of looking at it : “Remember the golden rule : Those who have the gold make the rules” (Anon). 26. The neoliberal rich and wealthy and their supporting politicians demonise Tax (but pay very little themselves). They also demonise International Aid (which Tax pays for) which could help poorer countries to progress, create jobs, develop infrastructure and vital services, and to develop themselves. 27. It is clear that the global elite's decisions and policies have been keeping child malnutrition ‘normal’ and permanent in some parts of the world, as they have done for decades. Major food crises recur frequently (e.g. in Africa and Asia) - even though we know how to prevent them. There have been many links between arms sales and poverty, arms sales and hunger around the world, and this is one very bad current example. At the time of writing this, the U.N. has warned that in Yemen 14 million people have been forced into extreme hunger and starvation and are on the brink of death. 28. This is happening because the U.S.A., the U.K., France, and others have been taking $billions from the Saudi Arabian government by selling them weaponry, with which they have killed thousands of people in Yemen - while destroying the food importing and distribution system of the country, along with its water supply, hospitals and healthcare system. 29. On this and on many other fronts, our morally and ethically deficient governments and our ineffective global governance system is failing the poor atrociously. Many attempts by different parts of the UN to prevent this human catastrophe in Yemen have failed due to the priority given by the USA, the U.K. and France (these three are among the five permanent members of the U.N. Security Council) to their disgraceful arms sales to Saudi Arabia. 30. Thousands of charities and NGOs around the world work very hard to reduce poverty and inequality. However, too often this can only ‘paper over the cracks’ of big structural problems created by governments and corporations. The great work done by many charities in this field can sometimes help exploited people to just about survive in the most degrading poverty. Charities and NGOs can often tackle the awful results of poverty but often cannot tackle its fundamental causes. The work of charities and NGOs can sometimes do enough to de-fuse social anger and political discontent. This may help to reduce or dissipate legitimate protest. 31. In this way, while claiming to be non-political, some work by charities and NGOs is actually sustaining the status quo, leaving in place the structural causes of poverty. That is clearly political. Despite all their good intentions the work of charities and NGOs should not help employers get away with underpaying workers. They should not let governments ‘off the hook’ so they continue failing to enforce laws or continue allowing corporations to damage people and planet. They should also not take the pressure off governments to remove the structural causes of poverty – to stop all forms of ‘structural violence’. problems or providing welfare services which alleviate poverty – but only if they can raise taxes to pay for these things. However, too often they do not do this. Instead of helping the poorest too many governments encourage, assist or subsidise the bad practices of businesses and corporations. To solve the structural problems it is always necessary to tackle governments, corporations, and those international bodies (e.g the World Trade Organisation, International Monetary Fund, World Bank, etc) whose policies create the structural problems. Asking charities and NGOs to paper over cracks will not do that, however hard they work. 33. Over seventy years ago a previous generation of world leaders came together in a spirit of peace, dialogue and international cooperation to fashion the United Nations, its Charter and the UN Declaration of Human Rights (both documents are still very relevant). The coming of the UN improved global stability after the second world war. However, that ‘post-war settlement’ or ‘world order’ has been coming apart in the past four decades while neoliberal capitalism has been dominating and distorting the world economy. The fall of the Soviet Union and Communism across eastern Europe at the end of the 1980s / early 1990s created more peace but fed the American craze for ultimate global power (U.S. ‘Hegemony’). 34. Over the past four decades, the divisive and competitive effects of Neoliberal capitalism have spread around the world and encouraged narrow Nationalism. The repulsive Trump’s administration in the U.S.A. is a current example of that. This has been fuelled by bigotry, xenophobia and racism and this toxic combination has become a major threat to global stability and order in the first part of the 21st century. 35. In September 2015 the U.N. adopted a new global plan for action, intended to end poverty among, other things. ‘The 2030 Agenda for Sustainable Development’ contains 17 sustainable development ‘Goals’ and 169 ‘Targets’, covering economic, social and environmental activities, …”in areas of critical importance for humanity and the planet.” We at Red Line Art Works agree with and support all of the UN Agenda’s values, fine words, goals and targets. 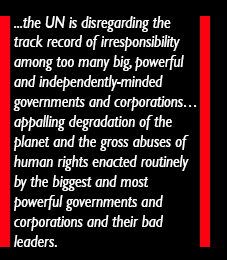 bad politicians, bad leaders, bad governments and bad corporations working powerfully in direct opposition to the U.N.’s Agenda. The reality is that they have been actively creating the Global Concerns which now threaten humanity (and which we highlight here), some of which the U.N. is trying to solve. Over the past four decades, governments (capitalist and communist) and corporations have all been pushing their own materialist, financial values which have put our planet and all its species (including us humans) at great risk. U.N. Members) increase taxes on and remove vital support for the poor - in order to give tax concessions, tax breaks and subsidies to the rich, and to businesses and corporations which they use to harm global citizens and our planet. We need only look at the way so many governments and corporations treat activists and the poor, the way they deny our rights, steal our natural resources, disempower activists, attack and fine or imprison them at every turn. 39. Governments and corporations have been busy for several decades stealing fortunes and the future from generations old and young. There is no reason to now believe that they are going to suddenly change their ways without massive and drastic action. The U.N. also says of its 2030 Agenda : “It is an Agenda of the people, by the people and for the people – and this, we believe, will ensure its success.”. The UN appears to hope that national governments will take their own independent national decisions and these will somehow magically add up to the drastic new global strategy needed to save/sustain the whole of the world's population and our only planet. Some governments will try to achieve that co-operatively. But the UN is disregarding the track record of irresponsibility among the big, powerful, independently-minded governments and corporations. The UN appears to have only an ineffective strategy for tackling the appalling degradation of the planet and the gross abuses of human rights enacted routinely by the biggest and most powerful governments and corporations and their bad leaders. Much more effective global strategies are needed to end global poverty, and to really tackle the other big Global Concerns. 40. Many politicians and political parties are actively and systematically demonising the poor and needy within their own countries, using press or media which support their views or which they own or control. That is nothing compared with the denigration and demonisation some bigoted politicians and political parties reserve for ‘foreigners’, migrants, immigrants, ethnic or racial groups – in fact any groups other than their own. Many politicians build their political careers on this type of disgraceful ‘othering’ and are proud of their own bigotry, xenophobia and racism. Many of these bad leaders are constantly critical of international bodies like the U.N., charities and NGOs which raise the issue of poverty (the U.S.A.’s Trump is just one example of many bad leaders). 41. In many countries around the world there are political parties who constantly demonise and marginalise all groups of the poor, and they deepen and extend poverty itself through their political policies and choices. On the international stage they denigrate nation-building, international aid and improvements in democratic governance, when even simple measures could benefit billions of people around the world, with additional benefits to overall global security. So extreme poverty and extreme inequality are not inevitable, they are a matter of political choice. "We are witnessing some of the greatest challenges the world has ever seen, without the global commitment to deliver change." Sadly, this truth spoken by Saad Alfarargi is not only aimed at national governments and bad leaders. It also challenges the United Nations, which over seventy years ago was set up with the elimination of poverty as one of its four main goals. Clearly, the whole international community needs to up its game. Big changes are still needed if we are to eliminate poverty globally.